NETWORK FINALS: FOX’s regional MLB coverage gained 0.1 in final numbers, while DATELINE and the rerun of TO TELL THE TRUTH fell the same. CABLE HIGHLIGHTS: TURN returned for its final season on AMC with a pair of episodes at 0.15/0.10. That compares to 0.13 for the 2016 premiere (on a Monday in April), and 0.19 for last season’s finale. HBO’s TJ MILLER stand-up special was at 0.15. 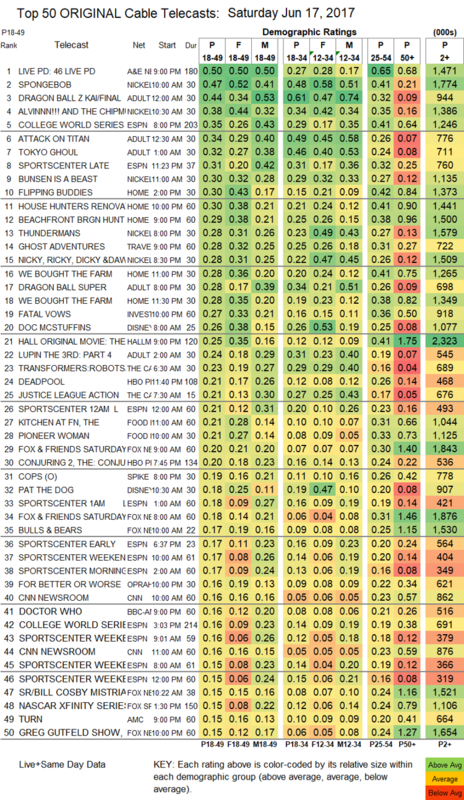 A&E’s LIVE PD continued its run at the top of the cable chart on Saturday, down 0.01 from last Saturday to 0.50. Nickelodeon’s morning line-up stayed strong, as SPONGEBOB rose 0.03 to 0.47, and lead-out ALVIN & THE CHIPMUNKS was up 0.03 to 0.38, with BUNSEN IS A BEAST up 0.03 to 0.30. Adult Swim’s late-night block performed as follows: DRAGON BALL Z up 0.02 to 0.44 (the primetime episode was up 0.03 to 0.28), ATTACK ON TITAN down 0.02 to 0.34, TOKYO GHOUL up 0.03 to 0.32, newcomer LUPIN THE 3RD at 0.24, HUNTER X HUNTER down 0.01 to 0.29/650K, NARUTO down 0.01 to 0.26/588K, and GHOST IN THE SHELL down 0.01 to 0.25/543K. ESPN’s coverage of the COLLEGE WORLD SERIES was at 0.35. The top-rated shows among HGTV’s entries were the afternoon FLIPPING BUDDIES and the primetime HOUSE HUNTERS RENOVATION, both at 0.30 (the latter up 0.02 from last week). ID’s FATAL VOWS ticked up to 0.27. Hallmark’s original movie THE WEDDING MARCH 2 was at 0.25. On Food Network, KITCHEN AT FN slipped 0.02 to 0.21, and PIONEER WOMAN ticked down to 0.21. Spike’s original COPS was at 0.19. On OWN, FOR BETTER OR WORSE aired a trio of episodes at 0.16/0.14/0.12, compared to last week’s 0.13/0.13. On BBCAmerica, DOCTOR WHO shed a tick to 0.16, and ORPHAN BLACK was also down 0.01 to 0.06.